It’s week nine and we are nearly there weight wise – I am now 77.5kg from 94kg. This week is where I have brought in some sessions, just little manageable ones. I have also structured my week to maximise my running and quality of the sessions. This has come out as a Monday tempo session then a Thursday rep session. This week started off amazing with the tempo on the Monday going so much better than I had planned. I ran 10:46 for 2 miles, a little harder than I wanted but I felt good and strong. Also, there might have been a good tail wind, but let’s just keep that between us! I had 3 mins recovery and did a 1-mile tempo in 5:19. Again, harder than I had planned as I was looking for 5:40 to 5:50 but I was pleased with the results. I am the kind of runner that does all my running to feeling not pace. This is the first time in my life I have used a Garmin properly and to be honest it’s only because of Strava that I’ve got so into it. I used to only use it to do tempos in Bushy Park (when I lived there a looooong time ago) and even then I would go on the 2-mile loop and just run to time instead of using the Garmin. I used to hate getting hung up on minute milling, as one day I could be 7:30 milling and it feeling like 6:00 milling and vice versa. However, it’s been really interesting to use it and see the progression. Going from 8:30 down to 6:30 now where I am becoming increasingly comfortable. My plan, if any of you are wondering, is to get to between 6 minute to 6:30 milling and for it to be as comfortable as possible, to be able to do 15 miles at that pace as well as 4 mile runs, so basically to be able to run it regardless of the session or run I’m doing. Anyway, back to training… On my non-session days it was 8 miles per day on Tuesday and Wednesday, then Thursday was a 1-mile tempo with 3 mins recovery then 8 x 1 min off 1 min recovery. Well, that is what it was supposed to be, anyway! What actually happened was that I was meant to get out of work at 5pm but I got stuck at my desk working until 6pm and wouldn’t get home until 6.30/7pm so I looked for field that I could go to by work to get it done so I could get home to my partner Rebecca and the baby. While looking, I found a track just over a mile away. So that was it, I was off to the track! I hadn’t done a track session for over six years or even ran on one properly for that long either, but my mind was set. So, as I jogged there my head was all over the place, thoughts racing. I had no idea what to expect and had so much doubt creeping in. ??? Day-88 ??? Session done, got on the track again! Oh how I love the track! Did 1 mile tempo in 5.10 then 3 mins recovery and then 8 x 400m, off 1 min recovery did them in 68/69 seconds in trainers (no spikes) then did 65 secs for the last one. I have to learn to hurt myself again, get to the uncomfortable place and hold it, which sounds crazy but it’s been so long since I felt it. It’s just teaching myself to get there again. Anyway, I am so happy with that session I’m smiling from ear to ear ?. I hope you all have had an awesome day. Let me know how your session and training go this evening, let’s share the love ? The closer I got the more the doubt crept in. Why? Everything was going well! Why was I freaking out? “Why am I here? Why am I going on the track, I don’t have flats or spikes? This is a mistake.” That was the conversation in my head. Anyway, I got there, I paid my £3.20 to the lady at reception and got on the track. 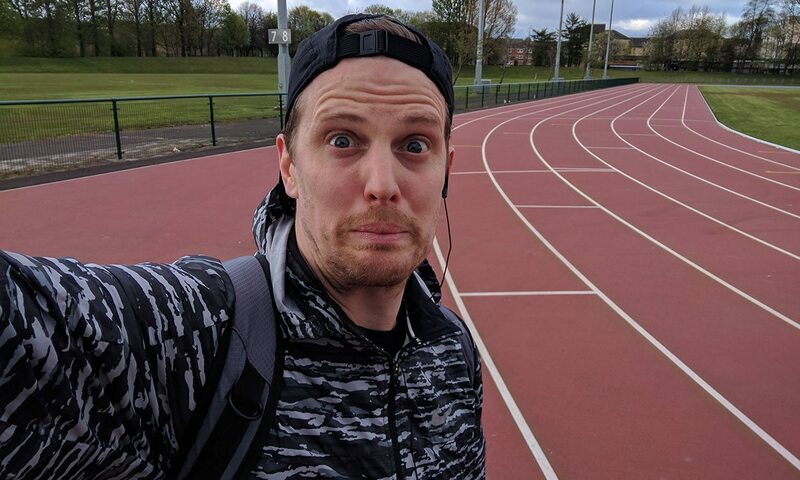 I continued my warm-up, doing a mile around the track to get a feel for it. It was strange being back on a track. Somewhere that I pretty much had lived on my whole life was now a strange place for me to be. I did my warm-up and got on with the session – a mile tempo was great at 5:20, feeling great and of course it was the track. All the old feelings came back – I was content and I was loving it! Then I did 8 x 400m off 1-minute rest and I hit 70 seconds throughout. No flats, no spikes, just normal running shoes! I felt amazing (have I said that already? I might have mentioned it!) I was smiling from ear to ear. I know now that I left the sport too early. I know from that session where my heart lies and my love for the sport is stronger than ever. I know this bet is to run sub-16:00 for 5km but, what if I do more? What if I run faster? WHAT IF??? It’s a fire that is burning inside me every day. Ask yourself ‘what if?’ See what comes back at you. The rest of the week was great, with runs at around 6:30 pace which I was pleased with. It’s now time to add core and strength into the weekly routine as my running is starting to take care of itself. So, as always, thank you for your support and just do me one favour this week. Ask yourself… WHAT IF?